When Sullivan Bradshaw’s brother Matthias is killed in an automobile accident that leaves Matt’s wife Sunday in a coma, he and his brothers, Flynn and Porter, agree to work together to care for Matt and Sunday’s six adopted children: Heavenly, 12; Twila, 10; Maddox and Milo, 7; Moisey, 6; and baby Oya. They decide it is best for the children if they remain in their home on their parents’ Pleasant Valley Organic Farm near Benevolence, Washington. Sullivan, an art history professor on sabbatical, is elected to be the on-site caregiver, with Flynn, a Texas cattle rancher, and Porter, a private security agent in Los Angeles, flying in on weekends to help. But Sullivan soon finds that housework, gardening, preparing meals, baking birthday cakes, and other sundry tasks associated with caring for six children means they are all living in chaos, and he has no time to work on the project for which he was granted the sabbatical. Rumer Truehart took a leave of absence from her teaching job in Seattle and returned to Sunshine Acres, the farm where her grandmother trains horses for therapeutic riding, when her grandmother had a heart attack. Lu, as Rumer calls her grandmother, needs someone to see that she doesn’t overdo after her triple by-pass surgery, and Rumer is determined to pay her grandmother’s medical bills before she returns to Seattle. Facing hefty bills even after exhausting her savings, Rumer answers an ad in the local paper for a housekeeper/gardener/cook with experience with children. But once she meets the six needy Bradshaw children and their hunky uncle, she can’t get away fast enough. She is afraid of the emotional involvement that the job will exact. However, when the Bradshaws face another crisis, Rumer offers her help. Soon, with a bit of a push from Byron Lamont, the patriarch of Benevolence’s chocolatiers, and the tempting salary Sullivan offers, Rumer become the Jill of all domestic tasks for Sullivan and his charges. Rumer’s own childhood as the child of an addict who was in and out of foster care and her degrees in child development make her the ideal person to care for the young Bradshaws. She identifies particularly with the tough-talking, tender-hearted Heavenly. Soon each of the kids has claimed a piece of Rumer’s heart, and Sullivan proves irresistible as well. But Sullivan bears scars from an abusive childhood as well. Can two wounded people trust one another enough to risk their hearts? 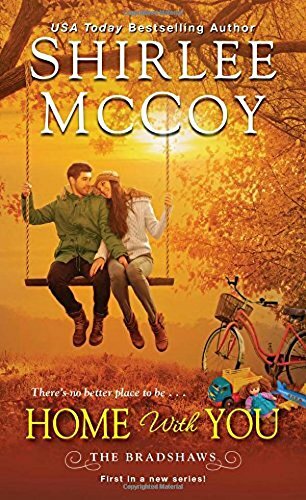 McCoy introduces a new series, a spinoff of her popular Sweet home series, with Home with You. 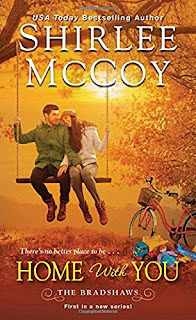 Sullivan and Rumer are both interesting, sympathetic characters who deserve happiness, and most readers will find it easy to root for their HEA. The real test of how much a reader enjoys this book may rest more on how she feels about kids in contemporary romance than it does on the central love story. The six Bradshaw children are a central part of this book, both in terms of the plot and in terms of emotional power. Given the pasts of Sullivan and Rumer, the sad stories of the six children before they became Bradshaws, and the death of one parent and the incapacity of the other, the pathos may seem overdone to some readers. Nevertheless, fans of the Sweet Home series will enjoy a return visit to Benevolence and the cameos by some of the characters from that series. The sense of community is strong as members come through to help meet the needs of a hurting family. This is a sweet romance with a touch of the inspirational. As such, it will not appeal to everyone, but if you like your romance heavy on heartwarming qualities, you will likely enjoy Home with You. Security expert and former Navy SEAL returns to take his turn parenting his nieces and nephews in Home Again, an October 30, 2018 release. I plan to make a return trip to Benevolence then. Will be reading this one. Thanks for info. It releases day before my bday. Thanks for the review. It sounds really good.